"Economy is our biggest asset, we need to protect," said Chen Zhencong, the deputy to the Hainan Provincial People's Congress, the mayor of Wuzhi Mountain city, had an interview with the reporter and indicated that Wuzhi Mountain would continue defending the ecological red line, promoting the development of people's livelihood and living standard. He said, Wuzhi Mountain would continue developing the construction of ecological civilization. According to the requirements of economical environment supervision, it would be guided by ecological environment quality, planning the appropriate projects. It would also base on the reality of Wuzhi Mountain, focusing on the ecological protection, rural revitalization of the poverty. 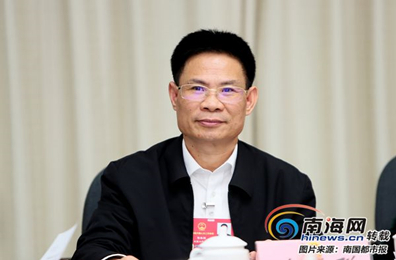 "The key points of the work in this year will focus on the industrial prosperity, ecological livability, rural civilization, effective governance and living prosperous,"said Chen Zhencong. He also stated that Wuzhi Mountain would cultivate tropical high efficiency agriculture with local feature, big economical benefits and contributing to the industrial restructuring. Basing on the development of traditional industries such as industries of rubber, areca and lichi, it would also develop the characteristic industries in terms of tea, sauropus androgynus and five-legged pigs. "The number of tourists and the revenue were considerable last year, we expect to have more than 210 million tourists this year," said Chen Zhencong. In the aspect of tourism industry, Wuzhi Mountain would continue developing tropical rainforest tourism, folk custom tourism and residential accommodation, turning green waters and green hills into gold and silver mountains.